Afterwards, we met with Yuri Maruyama from VMware Corporation for an interview to be used for social media purposes. We then met Michael Corey for the final Monster VMs Database Virtualization Doing IT Right (VIRT8290R) session. As expected for the final day of the conference, attendance was slightly down from Tuesday, but still a great crowd. I had a 3pm departure from Las Vegas, and had to leave right after David’s and Michael’s session concluded. I tried to reach David on my Uber ride from the hotel, and he was still speaking with some of the session attendees. It was great to see throughout the week that many of the session leaders left time at the end to answer questions. David had a 1pm #vBrownBag session in the VMware Village to present about vCPU Scheduling and Databases. If you missed this session, and would like to view the information, please check out the recording. Personally, VMworld is still my favorite conference to attend. It is the perfect mix of both technical content and social networking. We had a great week meeting with many partners and customers. 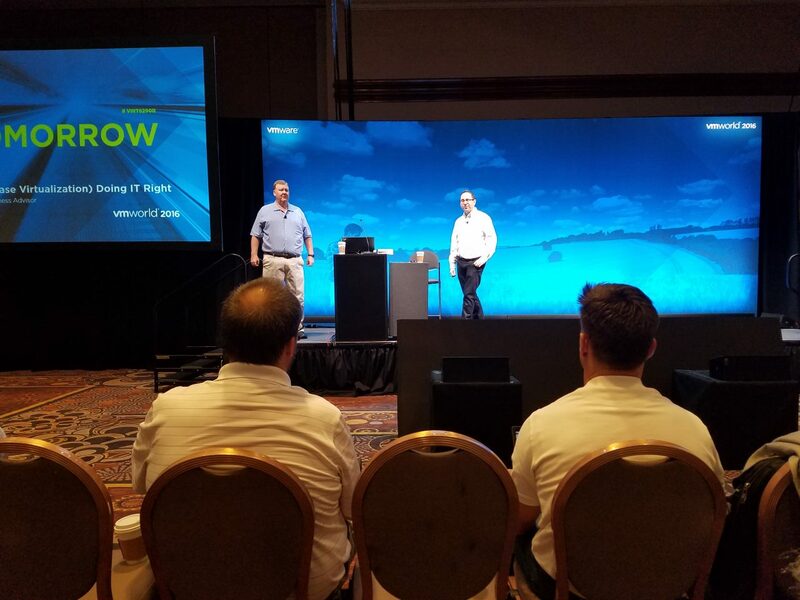 A major conference such as VMworld should energize customer and partner attendees to adopt, learn, implement, and sell more VMware solutions. Although it is a changing IT world, I left Las Vegas very satisfied with the conference week. Thank you to VMware Corporation and all the contacts we met at VMworld 2016!